Rhododendrons are beautiful flower plants that grow in highlands and mountain tops. According to Wikipedia, there are more than one thousand species of them. In certain countries, rhododendron growers produce flowers that have become important agricultural commodity. In Arfak range, I saw some species when I went hiking to the tops of Mount Soyti, Mount Kobrey and Mount Sensenemes. Foreign visitors who want to see flower plants of Arfak range usually go to Mount Kobrey because it can easily be reached by 4WD car. It is located between Lake Anggi Giji and Lake Anggi Gida. Everyone who goes there will see spectacular view of both lakes from an elevation of more than 2,500 meters above sea level. I personally visited this place several times. There were several species of rhododendron including Rhododendron konori, Rhododendron laetum, Rhododendron asperum, Rhododendron zoelleri. For me, Rhododendron konori is very special because the flower emits fragrant scent that is very potential to be extracted as essential oil or for parfume industry. This flower plant cannot grow in warm temperature area such as lowland area of Manokwari. 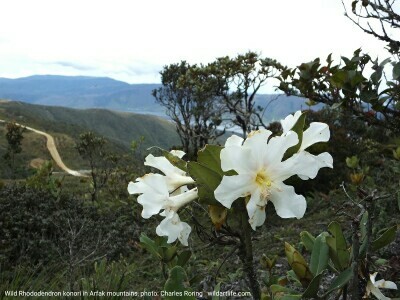 In addition to rhododendron, the tops of Arfak range are the natural habitat of various species of orchids, nepenthes, and myrmecodia. There were also a lot of other flowers plants in the front yards of local people's houses along the coast of Anggi Lakes. The temperatures in Lake Anggi Giji and the top of Mount Kobrey were much colder than in coastal area. Visitors are highly advised to wear thick clothing if they want to visit the region. They also have to charter 4wd cars to reach Anggi Lakes and Mount Kobrey. There was an interesting flower that I saw growing along the roadside of Anggi lake. It was called Passion Flower. This vine creeping plant produces fruits whose juice was very sweet. Local villagers call the fruits Buah Markisa. We can eat them fresh. People who live in Arfak mountains cultivated the plant and sell the fruits to big traditional markets in Ransiki town and Manokwari city.